How to draw Krillin from Dragonball. Krillin (クリリン, Kuririn) is a supporting protagonist in the Dragon Ball manga, and the animes Dragon Ball, Dragon Ball Z and Dragon Ball GT. He is Goku’s ally and a Z Fighter. Learn basic drawing technique for Manga, Anime and comics from step by step basic Manga drawing lesson. In this tutorial you will learn to draw a Manga character Krillin along with basic Manga drawing tips and technique. First, I usually start drawing with simple geometry shapes to construct the basic Manga head and body. By following this process, you will find drawing is lot easier. The secret is to get the shape and proportion right in the beginning. If you understand its basic foundation, it will be easier no matter what you are trying to draw. You also have to make sure the shape of eyes, nose and mouth are correct and in the accurate spot. I usually start of using sphere or circle as a base for character’s head shape, then next step would be figuring out the next geometry form to fit into the image. Krillin is a good-natured, outgoing and competitive martial artist. His only true vice seems to be his interest in women, though as the series progresses, his intentions lean more romantic, and in dangerous situations, he sometimes despairs about possibly dying unmarried. Once a fierce rival of Goku, he quickly became his best friend while training under Master Roshi. He also is close to Goku’s son, Gohan. 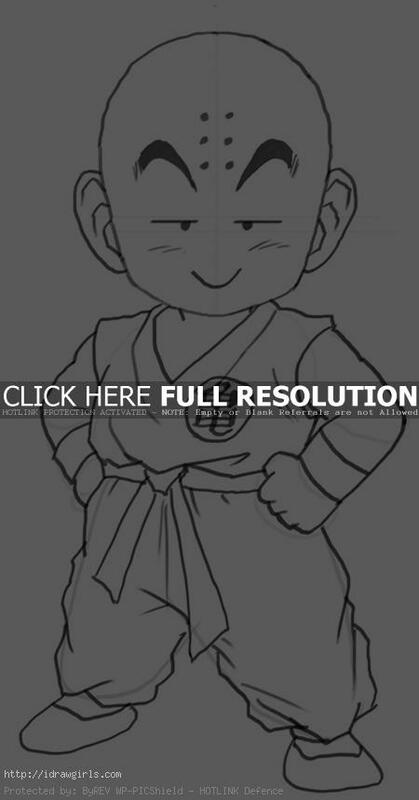 Below are step by step how to draw Krillin. Step one, I started with drawing his head, construction lines, and his torso. Step two, I drew eyes, eyebrows, and mouth over the existing facial construction lines. Notice that Krillin has no nose. Step three, I began adding detail on both his arms and body. Step four, I then drew his shirt over the torso, sash, and rough sketched his pants. Step five, I added wrinkle detail on his uniform. Step six, I finished the drawing.